An assumption that a lot of web developers have is that retinafying images by doubling their resolution results in files that are four times larger. 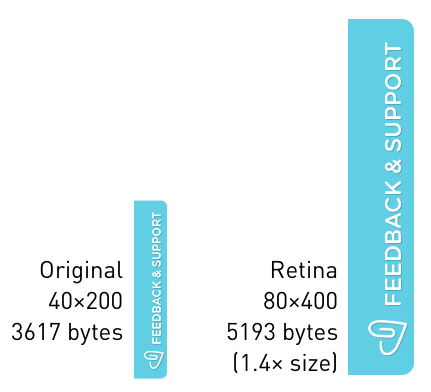 The reasoning goes like this: If I take a 100×100 pixel image, that has 10,000 pixels, and has a file size of, for example, 10kb, doubling the resolution to 200×200 means that there are 40,000 pixels now, and the file size must increase to 40kb accordingly. However, image compression doesn’t work like that—it hardly scales linearly with the amount of pixels in the image. Let’s look at PNG images first. These are often used for interface elements, logos and so on. There are huge areas of transparency, of single colors and of repetitive color patterns that doesn’t change. Because of that, actual file sizes of images that are twice the resolution of the original don’t differ that much. For JPEG images, you can just double the resolution (or go as high as possible depending on your original image source), and lower the JPEG quality. Don’t be afraid to go as low as 15 to 25, as shown in these example photos from my Retinafy.me ebook. Yes, on a normal density screen this would cause all sorts of ugly JPEG artifacts—but don’t forget that on a retina screen pixels are so small that you can’t see them, which results in JPEG compression artifacts being far less visible. And when you scale the bigger JPEG image down for display on a normal screen, you get results that rival much higher quality JPEG images at the small resolution. Note that exceptions prove the rule, and you may end up finding an image which doesn’t compress well or which has visible issues on low quality JPEG settings. For these, I highly recommend spending some time to figure out the root cause and implement workaround (you’ll find information about what to look for in my book!). These examples are straight from my Retinafy your web sites & apps ebook. Don’t let the pixels win! Grab a copy, learn all the tricks in a quick read, and save $10 over the final price while it’s in beta!